"Are you completely flipped out?" Joe Carnahan is one of my favorite directors in Hollywood today. I have stated on numerous occasions that The Grey is my favorite film from 2012. So I was eager for Carnahan's latest film, Stretch for a while. Then I got nervous. Why didn't Universal release this in theaters? The film had been in development limbo for a little while. It isn't the worst tale of a film being slowed down by the studio system I've heard of, but it makes you think. I don't know the details of the story for certain, but my understanding is that Stretch is a five million dollar film made by Universal Studios who after post-production finished decided to not give it a theatrical release and send it straight to digital release. So let's think. How many straight to DVD films can you think of are that good? Not very many. Suddenly, I wondered. Is there a reason Universal doesn't want to advertise it? Is it terrible? I couldn't even find any reviews. At best, I had positive word of mouth and trust in a director I admire. I decided that my fears were probably irrational, that the likely excuse was that Universal didn't want to waste time advertising a film that wasn't based on an existing franchise, didn't have the biggest names attached, or quite simply were too lazy to advertise. As good or as bad as it could be, this was never a film that would open number one at the box office. Either way, I decided Joe had earned my trust, and no matter what, I want to support an original film, good or bad. So I decided to check it out. Patrick Wilson (Watchmen, The A-Team) stars as Kevin, narrator and limo driver in L.A. who at this point in his life has wasted more time than he has left. He's been dumped by his girlfriend (Brooklyn Decker), can't get an acting gig to save his life, but that's okay because he'll be dead by midnight if he can't pay his gambling debts. Scrambling for a way to come up with the money he owes very dangerous men by midnight, Kevin agrees to take a client from his limo dispatcher and only friend Charlie (Jessica Alba) The client is Roger Karos, an billionaire maniac who is rumored to tip in the thousands. Karos, much like Tom Cruise in Collateral, is only in town for one night and needs a driver who can handle whatever may come their way. So Kevin and Karos' journey begins. The night forces Kevin to seriously evaluate his entire life demanding the most out of him physically and mentally. The curveballs come hard and fast and it will take all of his wits to stay in the game. From this point the plot progresses as you'd expect, and I mean that in the best possible way. Kevin truly has everything to deal with from rival limo companies, Karos' impossible demands, the omnipresent ego of Hollywood, and because the night was too easy, his ex-girlfriend. Wilson keeps us in it however, and you find yourself rooting for him. The insanity thrown Kevin's way is perfectly balanced by Wilson's ability to keep his calm, or at least look like he's keeping his calm. He's a great anchor and a character you want to see come out on top. The real standout of the film though is Chris Pine (Star Trek, Smokin' Aces) as Roger Karos, Kevin's billionaire client for the evening. Carnahan seems to be the only director out there who enjoys letting Pine play something other than the generic white, straight, good guy action role lead. His turn as one of the Tremor Brothers in Smokin' Aces proves just this and now his turn in Stretch affirms that Pine can play the wild card. Chris Pine (seriously) in a standout performance as Roger Karos in Stretch. But Pine isn't the entire film. I've been a fan of Patrick Wilson for some time, and he continues to make me smile here. Some may find his ever present voiceover annoying, but I personally thought it played well. He's a good anchor for this tale of insanity, and you'll be rooting for him before long hoping he gets his life in order. As I've said, Stretch is a film that the less you know, the more you'll enjoy it. So this forces me to write very generally, but the acting is solid all around. David Hasslehoff and Ray Liotta have fun cameos playing themselves. Ed Helms plays a former limo driver and now figment of Kevin's imagination, offering unsolicited and very sarcastic commentary to the proceedings. Jessica Alba may appear initially like a weak link, but as her role gets more involved so does she. The dialogue is crisp and the plot never loses sight of the finish line. It's a thrill ride, but even it's darkest moments, Stretch is fun. Carnahan has delivered another winner, more like The A-Team or Smokin' Aces and less like The Grey. I hope the director who gave us Neeson as Ottway will return before too long, but Stretch isn't a bad way to kill the time at all. So sit back, pay your limo fare, and enjoy the ride. 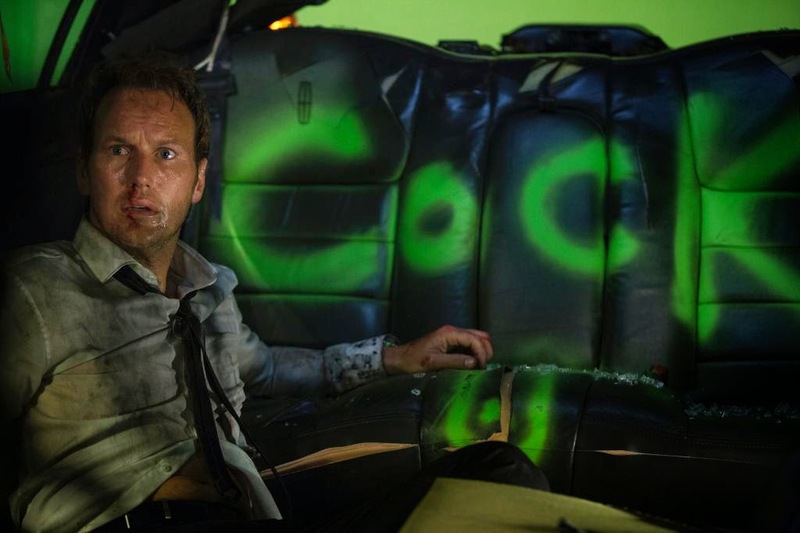 Stretch is a tightly focused and expertly handled thrill ride with Patrick Wilson capably holding his own and keeping his charm against a revolving door of scene-stealers and plots. It's a fun, straightforward, and solid movie with enough laughs and menace to balance it's off-kilter nature. Also, Chris Pine. Starring: Patrick Wilson, Chris Pine, Brooklyn Decker, Jessica Alba, Ed Helms, & James Badge Dale. Stretch is available now on Amazon Instant Video & iTunes.